For two years, the faculty at Saint David’s has been learning about how students can show their thinking in every class, beyond merely answering an answer correctly on an assignment or writing an essay or determining the correct answer to a math problem. It seems like this should be a fairly straightforward task, but without routines built into the classroom for this purpose, students and teachers often miss out on recording their thinking as it is happening. When a student writes an answer down on his math worksheet, he is demonstrating a guess, but not how he arrived at his answer. With the help of Harvard Project Zero’s Mark Church and his text Making Thinking Visible, the faculty of Saint David’s has been learning that by parsing thinking down into more discrete and more visible steps, learning can become deeper, more critical, and ultimately more foundational. Mark Church advocates displaying thinking in many ways, but he also suggests some specific thinking routines that give a sense of structure to showing students’ thinking. 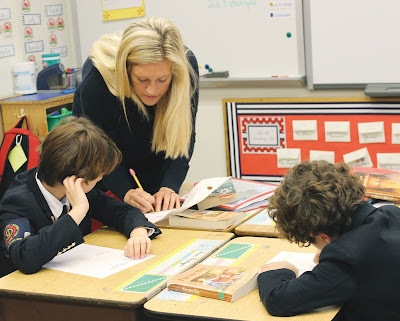 In the Third Grade, the teachers have employed several of his routines in reading class, as the rich literature available to third graders lends itself well to deeper thinking. 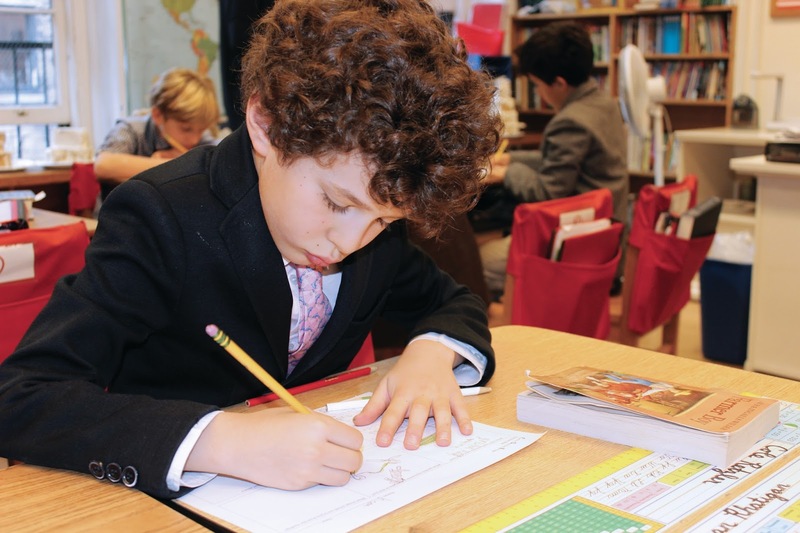 In Third Grade, the boys transition from learning how to read to reading in order to learn. 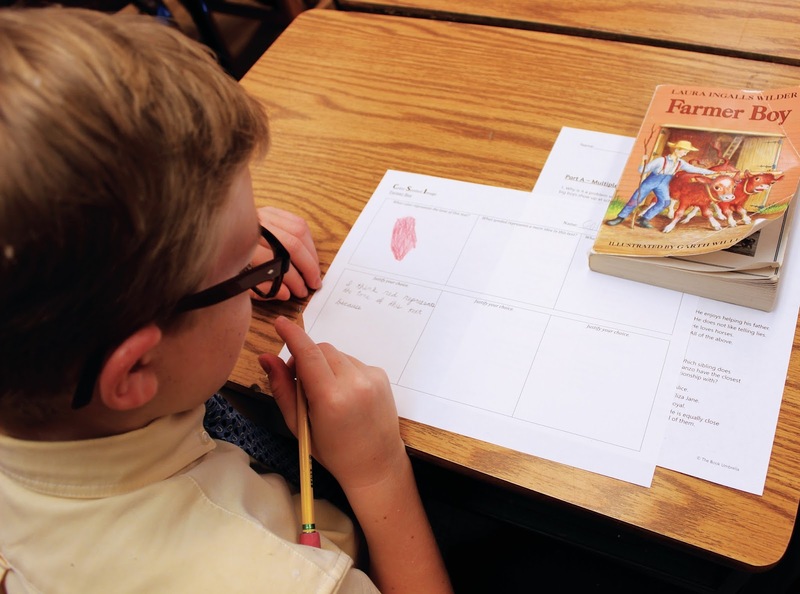 Their ability to read more difficult texts has improved, and, developmentally, they are becoming better able to empathize with characters in fictional texts. One routine that has become integral to Third Grade reading is called Color-Symbol-Image, an exercise that can be used as a formative assessment of reading comprehension or a more informal assessment of student engagement. In this routine, the students are asked to reflect on a passage that they have read and decide on a color that qualifies the passage and to explain their rationale for that choice. Next, the student decides on a symbol that represents the passage, draws the symbol, and writes a quick explanation. Finally, he decides upon and draws an image that illustrates the passage with several sentences describing it. When we began asking the boys to use this routine, we thought they might find its abstraction difficult. There would be no right or wrong answer; its open-endedness might make them nervous to write anything down. On the contrary, the boys responded to this assignment immediately and completed it intuitively and with minimal questions. At times, the routine can become too rushed and not thoughtfully done, which is when the justification part of the routine becomes important. After completing the drawn and written part of the assignment, the boys meet in groups to discuss their choices and explain why they chose them. As they are discussing what they chose, the teachers circulate and listen to these conversations. A common question the teachers ask to promote justification is “What makes you say that?” The boys quickly learn that they must have a reason for their choices and must be able to articulate their thoughts. The concrete drawings of the colors, symbols, and images enable the boys to have thoughtful conversations about characters’ motives and personal connections. They ground the conversation in something concrete, but allow for open-ended discussion as boys agree or disagree or simply connect to what another boy expresses. Recently, a reading group read a chapter in Farmer Boy by Laura Ingalls Wilder and instead of responding to comprehension questions with written sentences, the boys were asked to think about the chapter in isolation from the rest of the text. After reviewing the chapter independently, the boys then chose a color to represent the tone of the chapter, a symbol to represent the main idea of the chapter, and an image that stood out in their minds. With little hesitation, the boys dove into this assignment and seemed eager to display their thinking in such a novel way. They still wrote three sentences to justify the colors, symbols, and images that they chose, but the bulk of the task was spent on the boys thinking and drawing, making their thinking visible in a more visual way. In Third Grade, the boys are beginning to think more abstractly, but often return to a more literal level of comprehension, so the symbol section of the assignment was difficult, at first. After class discussions about symbols, they are now able to complete this task easily and thoughtfully. Once done, the boys then discuss their choices with each other, learning how to listen and to respond to each other respectfully and thoughtfully. In this way, we are using the Making Thinking Visible routines to introduce class discussions, so that the boys don’t use their time to speak as simply a platform to share their ideas, but as a time to respond to others’ ideas, as well. Another boy chose a pie to symbolize the chapter, as the chapter revolves around the family’s huge Christmas dinner and pies are mentioned throughout the chapter. Many boys chose images of the family sitting around the dinner table as representative of the main idea of the chapter. Their thoughtful responses showed that the boys are able to identify the tone and main idea of a text and allowed them to represent their thinking both visually and verbally. The exercise not only acted as a way to show deep thinking, but also as a way to extend it, as the boys then used their work for discussion about the text. 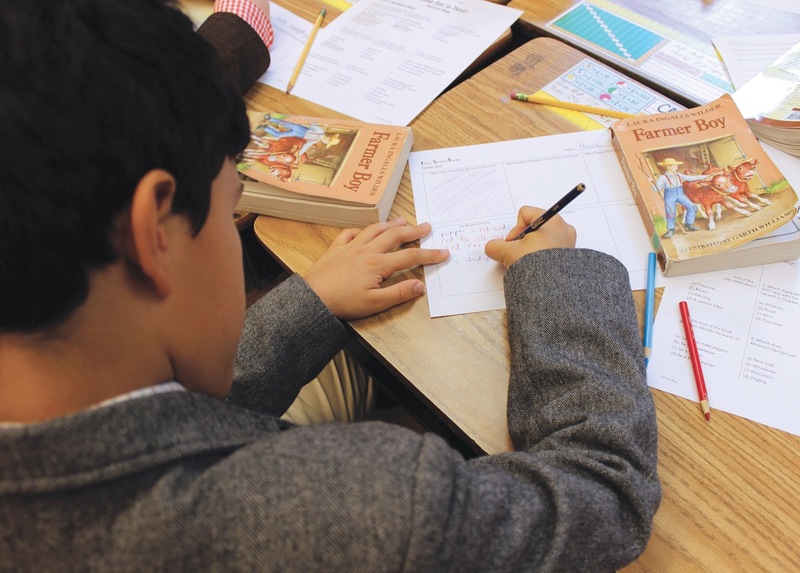 Adding thinking routines to our reading classes has enlivened the Third Grade classrooms, creating a more open environment in which to think about and to discuss literature. The boys have become even more invested in their studies of novels, excited to discuss their ideas with each other and their teachers, and proud of their ability to reason critically.